This CellML model runs in both PCEnv and COR to recreate the published results. The units have been checked and they are consistent. In 2006, Shin et al. 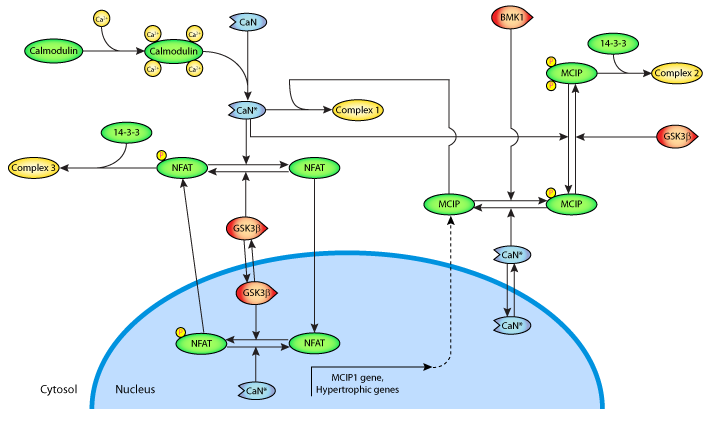 published a paper which modelled the dual role of MCIP in cardiac hypertrophy. In the study described here, Cui and Kaandorp have extended this model to include more recent and extensive experimental data. They used Cellerator, an open source software, to automatically generate the equations, and the model was subsequently translated into CellML to facilitate future model exchange, reuse and implementation. Simulating Complex Calcium-Calcineurin Signaling Network, Jiangjun Cui and Jaap A. Kaandorp, 2008, Lecture Notes in Computer Science, 5013, 110-119, PubMed ID: 16445978. Derived from workspace Cui, Kaandorp, 2008 at changeset 061e2449aa9e.